best slam from 12" sealed, 1000watts, 1 cube ? Either or, you don't get much better than those. I'd pick the GTI. If you had 2000w I'd recommend a SSA XCON (1750w rms). The SSA Icon is also a good choice but many say it lacks output. 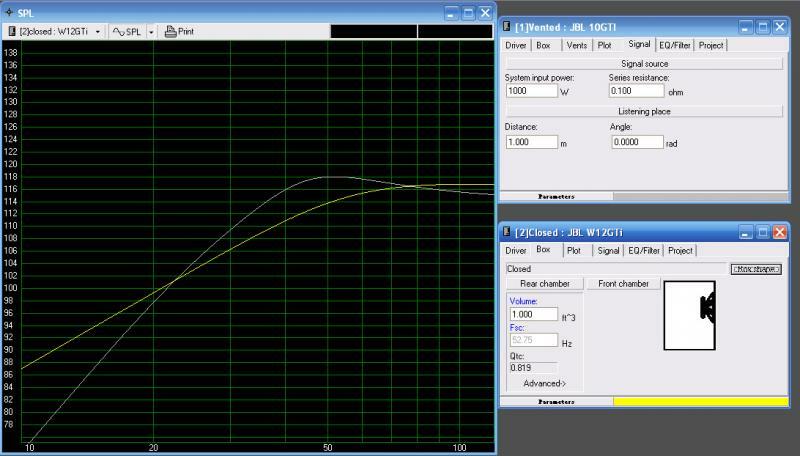 If you want more output go with two ported 8's in 1 cf3 + port or a ported 10 in 1-1.5 cf3. well if spl is more important and assuming you are space limited... you should look into a ported 10". In virtually all cases a ported 10" of the same model will be louder than a 12" in a sealed box...plus it'll sound great as well. Here's a simulation using a Jbl w10gti in a ported 1 cube box @ 36hz vs. a w12gti in a sealed 1 cube box both getting 1000 watts. This correlates with my personal experience as well in most mid sized vehicles. If ported, use an aeroport sticking out of the box and if you're mounting the box to the side, run the port along the bottom rear of the trunk. Barely noticeable. is 8 gauge short 3' run ok 1000watts? Quick Reply: best slam from 12" sealed, 1000watts, 1 cube ?